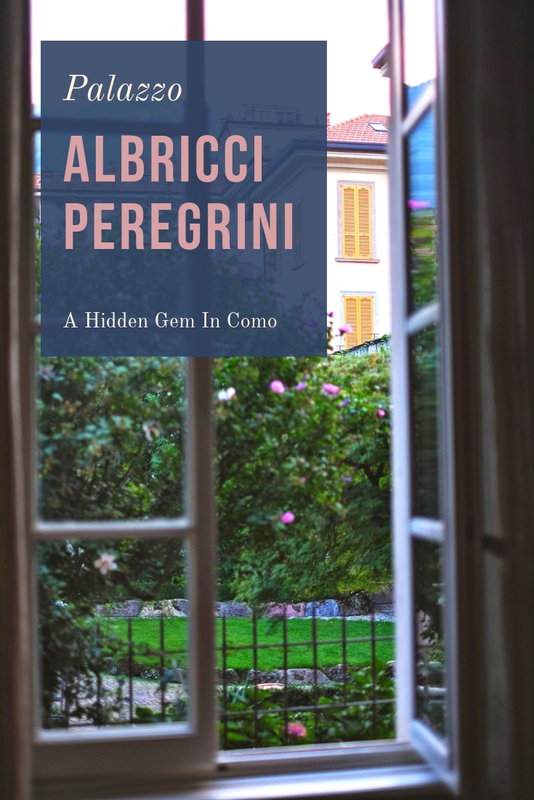 Continuing our discovery of Palazzo Albricci Peregrini; we share with you our experience staying at this hidden gem in the historical heart of Como. Why Como? 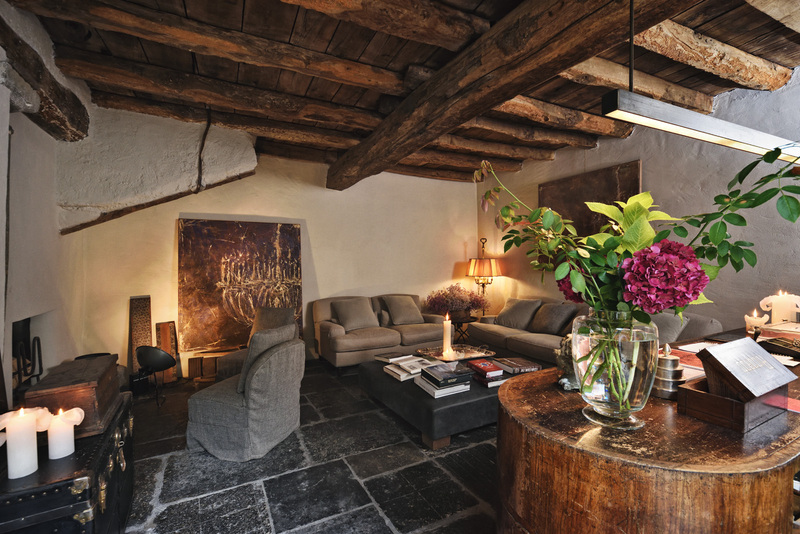 Why not stay at Bellagio, Varenna or other charming ancient villages around the lake? The main reason I chose the town of Como as our lake exploring base was the ease of the direct express train connection between Milan and Como. It’s essentially an easy commute. From my research, Palazzo Albricci Peregrini fitted our needs. It is only 15-minute away by foot from San Giovanni railway station; is situated on a quiet cobbled road in the heart of the historical town. Cafés, restaurants; local bars, chic boutiques and supermarkets are just around the corner. Enjoy art and history? 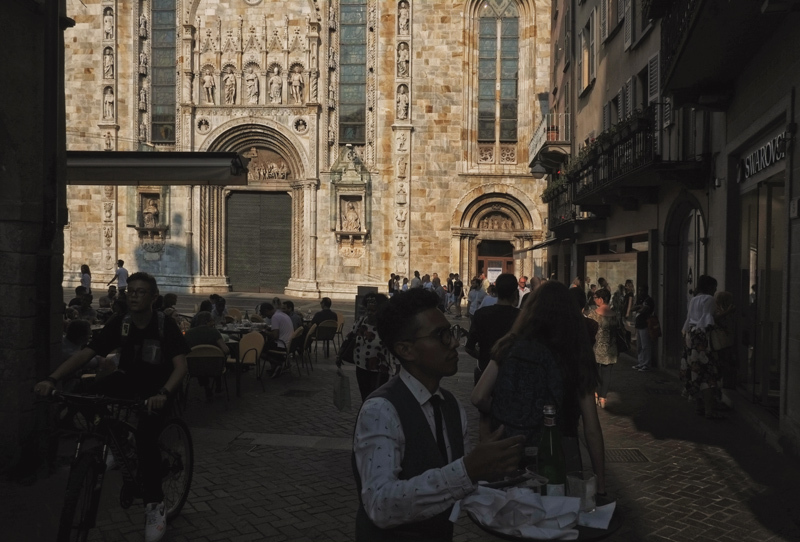 Why not taking a short walk to visit the Archaeological Museum (Museo Archeologico Paolo Giovio), San Pietro in Atrio Art Gallery, or pop your head into one of the many beautiful churches like San Fedele and the Cathedral of Como. During our five-day September visit, Kent and I were enchanted by the Medieval Manifestation of Como (known as Palio del Baradello). This historical celebration festival has taken place annually in the city since 1981. We stumbled across an ancient recreation in the Piazza del Duomo. 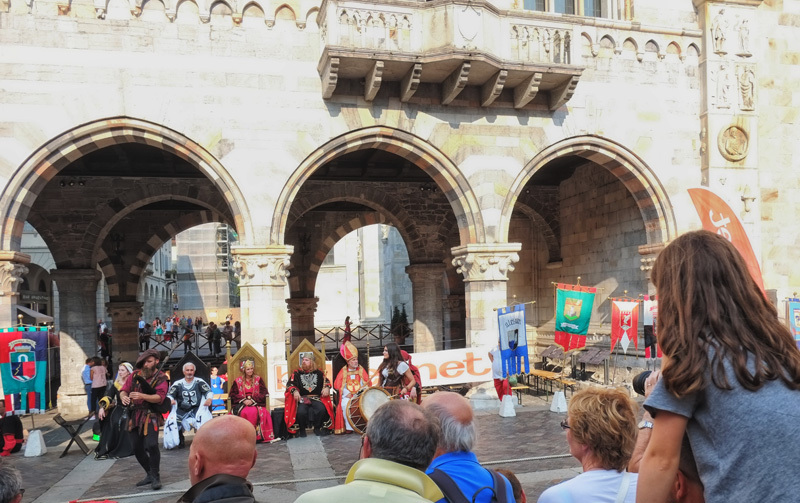 People dressed as royalty, knights and dames, acting out scenes from the Middle Ages. I love the idea to live again and embrace the glorious past in Romanesque settings. ‘Where is Lake Como?’ Yes we were eager to see this famous lake just like any other tourist. On our first attempt without a map, we ended up heading in the opposite direction; out through the famous town gate, which was not the way to the lake. We found the lake – by following our map. Striking out again in the correct direction, down across the pretty Piazza di San Fedele; a little further on to the magnificent Duomo, nearly there… We realised just what a short walk it was. From my very first sighting I thought ‘What a beauty Lake Como is!’ as I gushed at the time. The scenery is breathtakingly beautiful! You can walk or cycle the lakeside promenade, or head out onto the lake itself; explore its beauty, the towns and villas by slow ferries, rented boats or sail above it all in a sea plane. To me personally, Como has it all. It is a place with ancient roots. For those who are after medieval architecture and history, it’s there. Modern enough for trendy boutiques if that’s your cup of tea. Small enough for you to enjoy friendly local hospitality, yet large enough to indulge in a good variety of restaurants, cafés; bars and places to visit. 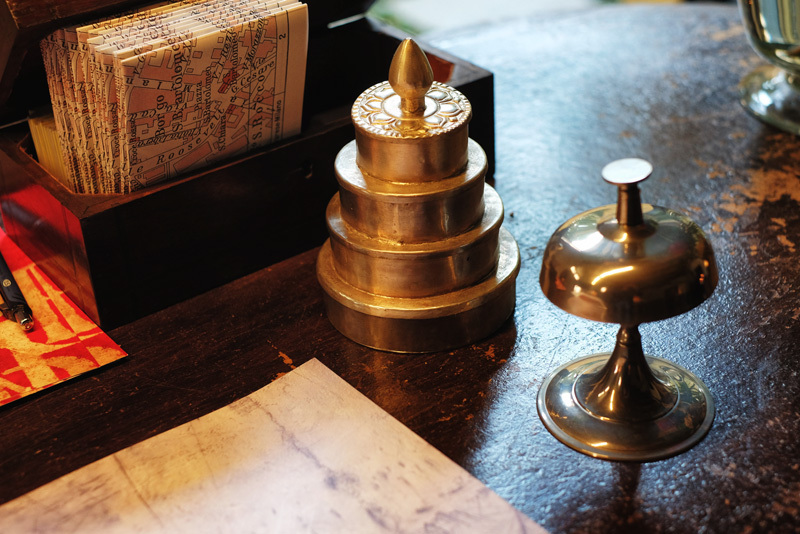 Not just a sheaf of papers… Polina also helpfully suggested to Kent and I some must-see attractions in Como and on the lake – a local’s insight on what’s worth visiting. The restaurant recommendations had all the information in detail on the sheet, including the distance from our accommodation. Whether you desire one-michelin-star fine dining or more casual eating out choices; a local pizzeria around the corner or one with amazing lake views. This A4 list has it covered. Someone had put a lot of thought into it, as a traveller I had not seen anything quite so detailing and I was impressed. 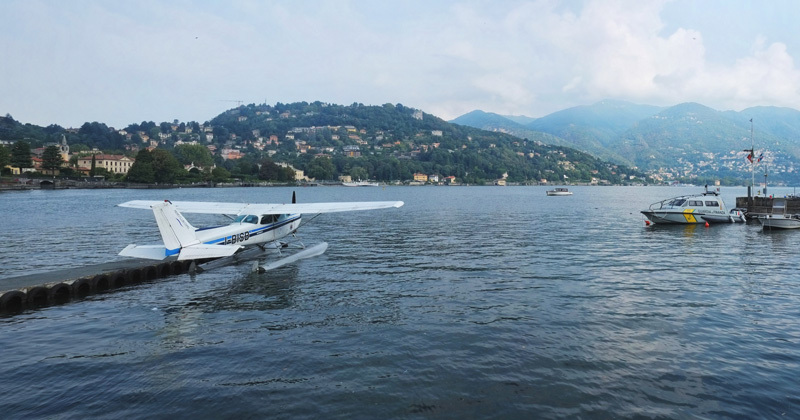 If sea plane rides over the lake or those classic speed boats skimming across it are your thing, the reception staff can help you organise it. Although Kent and myself were not into sea planes nor fancy boating adventures; we did put the ferries’ timetable to good use. Taking advantage of the Hydrofoil’s speed, well that’s a bit like taking a plane over water, to make the most of our time. We explored several stunning lakeside villages such as Lenno and Varenna. Surrendering to the joys of slower ferry travel on our final trip back to Como from Bellagio into a glorious sunset, the views were just spectacular! Typical Australian that Kent is. He has developed the habit while travelling of finding and purchasing his own beers at a local establishment and replacing the ‘hotel beer’ in the minibar to keep them chilled. Well it does keep the bill a little lower! Only our suite had no minibar fridge. ‘No problem’ as Kent was told, next minute we had a new small fridge delivered right to our door, and plugged in! Thank you Polina. As bloggers, we do work during our travel. Although our suite was very comfortable with a large couch and easy chairs, a comfy bed but there was no desk. Kent loves a desk to edit as he uses a mouse not the little laptop finger pad. Again no problem and a small table and a chair were found and installed – perfect! There seemed nothing too small or too great to ask. 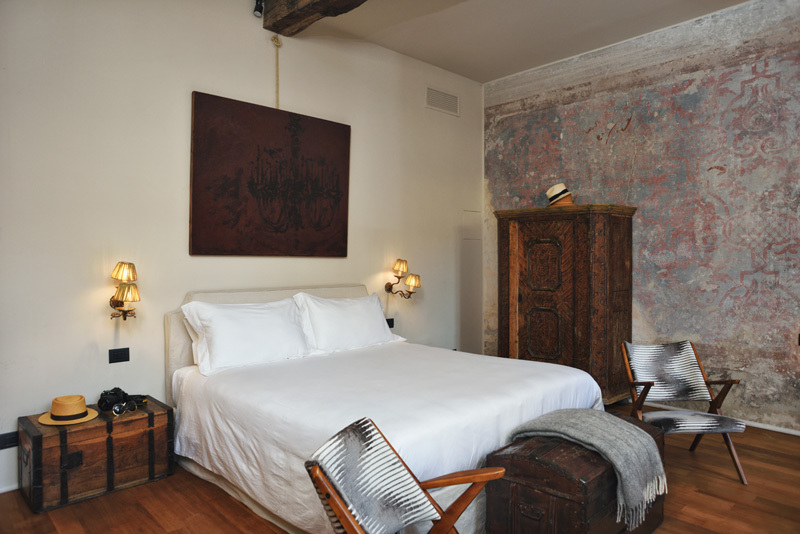 The team of Palazzo Albricci Peregrini has a wonderful ‘can do’ attitude and they did their best to fulfil our needs. Oh, and the fresh flowers in the vase in our suite were replaced regularly. Little thing like this makes all the difference. 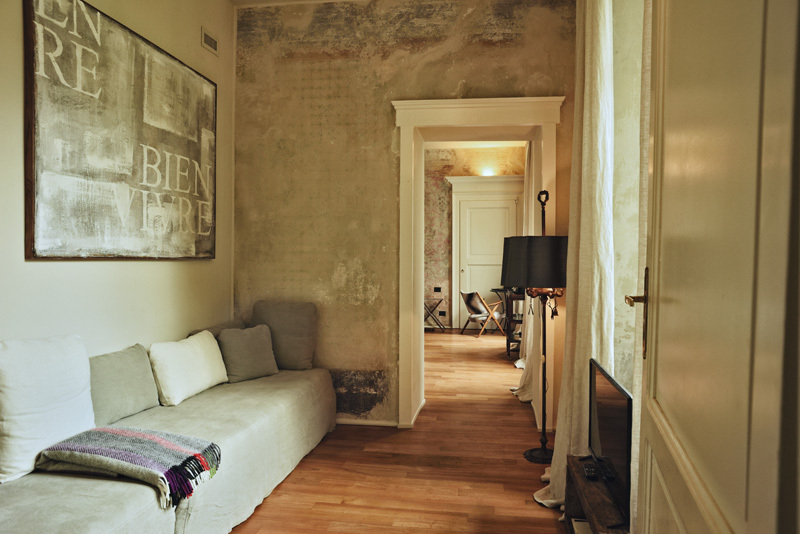 There are six rooms at Palazzo Albricci Peregrini, each has its own name and character. Our room La Scrustada is ‘named after the original paintings found on the old walls’ as we were told by Lidia on the day we checked in. This room has a separated lounge, so it is actually a suite. Although Kent and I barely sat on the dove grey sofa watching TV; we appreciated this extended space. The lamp is a modernised antique with little metal scissors, keys and industrial pieces hanging down as decorations, I think it’s very cool! Walking into our sun-filled stylish suite; the detail that first grabbed my attention was the fabulous walls. I adored the rubbed back paint finish also revealed the old painted pattern work on the wall. Truly layers of time! Our beautiful antique wardrobe was also stripped of the paint to reveal an old wood grain texture. The marble fireplace and high ceiling were complimented by a framed mirror and linen window drapes. Our bed, large and very comfortable. The trunk bedside tables, not only were they charismatic, they were rather practical. Kent and I also had good use of those two arm chairs with funky fabric. Ah, and that Chandelier painting over the bed by Lombard artist Marco Solzi… It doesn’t happen often when staying in a hotel that you have a true original art work in your room. This series of Chandelier paintings by Solzi found throughout the building; encapsulates a theme and mood of luxurious living beautifully. The bathroom is fine and contemporary jazzing on styles of the past. 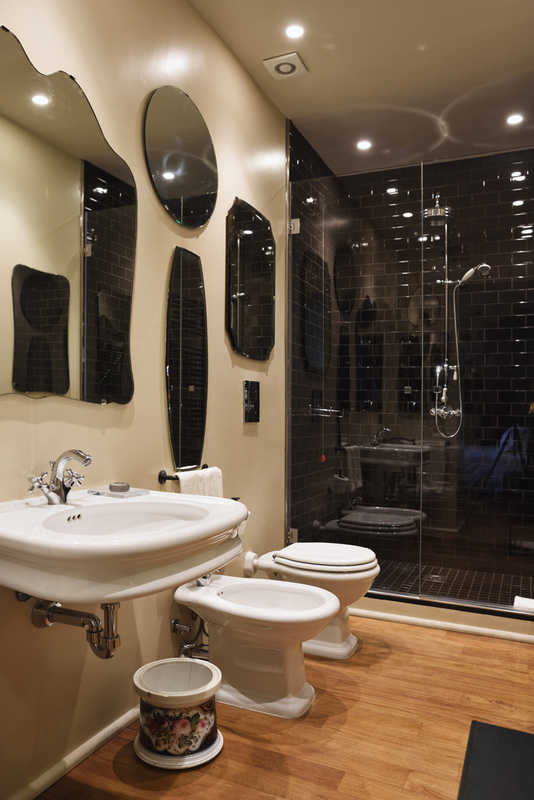 From the Victorian style exposed shower set and its huge shower rose, with abundant water pressure; the modern glass wall, black tiles and a galaxy of vintage-style mirrors of different shapes and sizes adorning the wall. No bathtub alas but the bathrobes, slippers and towels were all top quality and the layout of the room was impeccable. Missing your gym? In Kent’s opinion there is something better for guests to use – classic town bikes. With a backdrop like Lake Como, riding through the old streets and squares or by the lake itself is something you don’t want to miss out on. The above picture he took during one of his morning rides ‘says a thousand words’. I’m not much a bike rider, but having said that, even I couldn’t ignore these stylish bikes and had to borrow one for a photoshoot. I did even ride a little bit in this very bike friendly town – stay tuned for this cycling fashion story to come. 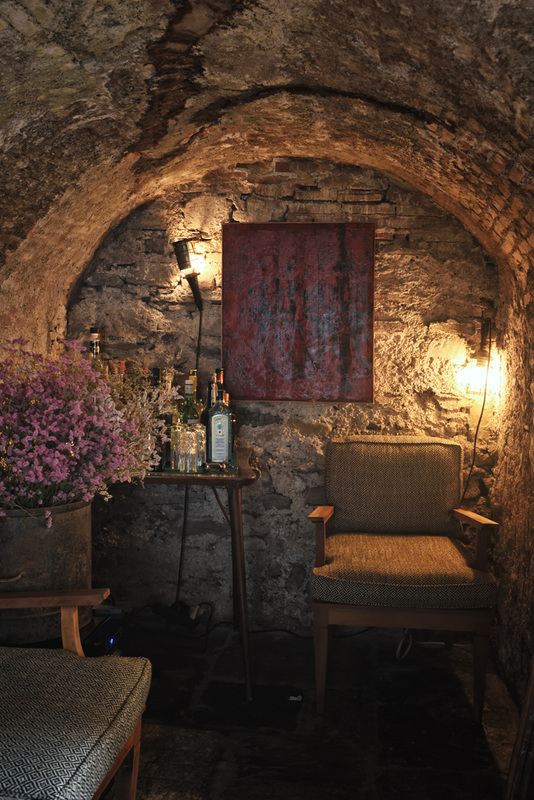 For indulgence there is an open bar, tucked but not hidden; behind the reception desk in a kind of ancient grotto at the end of the garden. A drinks table with local liqueurs and the usual international suspects and wine. You can choose indoor or outdoor sitting depending on the weather or your mood. More indulgence? How about a full-body relaxation! A massage can be booked. Palazzo Albricci Peregrini has its own massage room. In our suite there’s a pod espresso machine; tea bags and a kettle. Inside our wardrobe, loose wooden hangers, a safe and a first aid kit. Although we only turned on our TV once; the large flat-panel TV in our lounge room had access to Netflix. In the bathroom, I was impressed by the generous sizes of AquaFlor toiletries. During our Italy travel, I was surprised that several 4-star hotels didn’t supply body lotion or hair conditioner. I also found the best hair dryer at this Urban Luxury House. 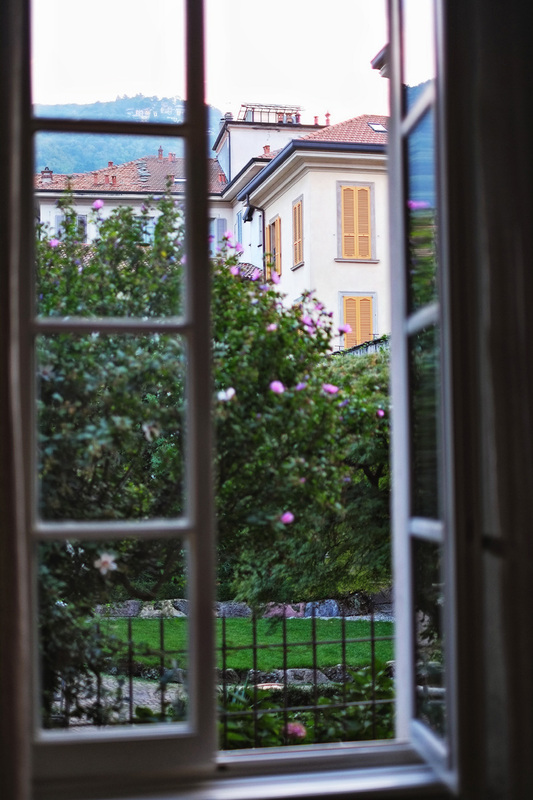 During our 5-night stay, though warm it was not hot; we turned off the air conditioner and simply opened the tall French windows to let the fresh air flow. Now that’s a luxury right there! 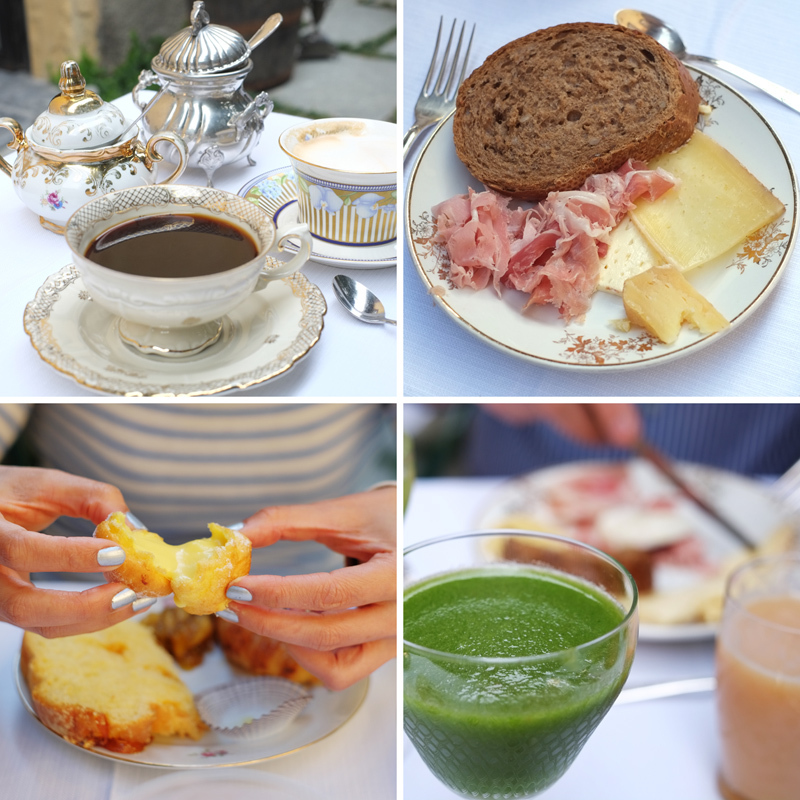 Breakfasts at Palazzo Albricci Peregrini are truly among the highlights of our Como experiences. Out in the sunshine, arriving each morning after our coffee, or tea of course if you choose. A heavily laden tray would appear at our table, jugs of vividly coloured fresh homemade juice mixes brought by lovely Polina, Alba or Lidia herself… ‘Would you like to try the “Vitamin shot” this morning? This is Youssouf’s recipe from Africa.’ Youssouf is one of the staff and I adore having the cultural engagement and exchange through a healthy shot glass of mixed juice. Very attentive and personal I thought. And of course when Lidia and Max came back from their break in Switzerland, we saw a delicious Swiss cake ready to be shared in our breakfast table. The kitchen seems to thrive on homemade juices, jams; cakes, ricotta cheese and yogurt… Beautiful artisan charcuterie and breads. Each shows so much care and this kind of personal touch is what helps make a vacation memorable. I’ll also share this breakfast experience in its own post. Breakfast at Palazzo Albricci Peregrini isn’t just a meal to be ticked off at the start of a day; it’s full of joyous moments to cherish. Lidia once told me that she ‘believes in providing guests with what herself and her family would love to be receiving on their own travels’. The Galli family has set the bar high for their Urban Luxury House, from the standard of the furnishings, the aesthetics; the staff, the food and to all the details contained therein, and have done so with much heart and soul, it makes a huge difference. To tell the truth, I’d be very surprise if there’s something better for our needs in Como. Kent and I could not thank the hard working team enough who went above and beyond making our stay in Como an unforgettable experience. 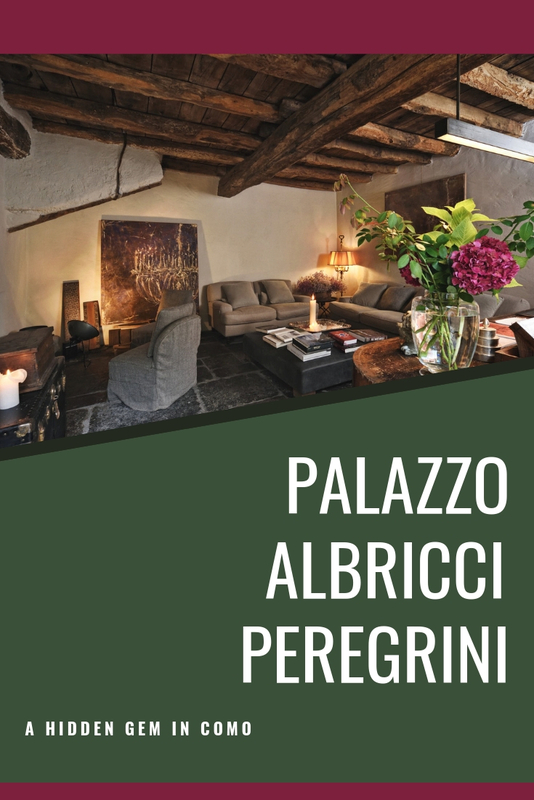 Not only do we highly recommended this boutique gem; we would definitely return Palazzo Albricci Peregrini for more fabulousness when we revisiting Lake Como. 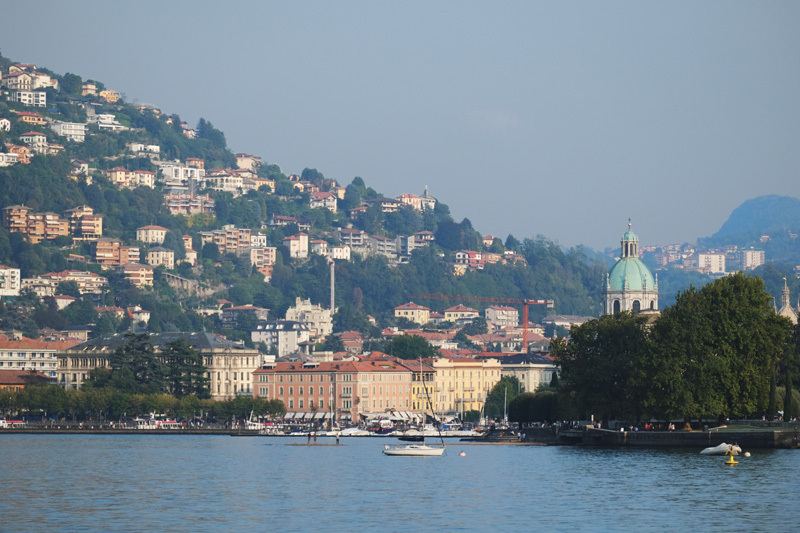 That was a terrific stay – Como, the Palazzo, all terrific, so much to do and discover. What a wonderful read to be enjoyed by all even if you don’t desire travelling. However, I am now sorely tempted to add this Bed & Breakfast to my bucket list. What you are sharing here is more than a hotel review… The brief introduction of Como I found very enjoyable. Plenty of helpful information in this post. Thank you. Como has never been on my to-see list, however after reading it you have plant a seed in my mind. This hotel seems to be a wonderful place to stay when you go to an amazing city like Como. Stunning images… each has taken me to this dream destination. The guest house seems very cosy and welcoming, just the way I like it!